We left a cold, dark Richmond at 3:55 a.m. It had been ten years since I had followed 64 to the Virgina coast, through the amber lit tunnel and south across the Wright Memorial bridge to the Outer Banks of North Carolina. I had since relocated to west coast where bodysurfing grew into the invasive “hobby” which touches all parts of my life. While the coast in the west has been kind to offer all that she has, it had always been a dream of mine to bodysurf the sandbars I had grown up swimming. This time the trip included my brother and sister. She slept in the back while he and I talked about how bad the wind would probably be. The sun began to ignite the sky as we crossed Dare County and familiar sights led the way. The black and green Grave Digger monster truck on its nose, the red trimmed hammock store and their countless advertisements all signal that the path is getting shorter. We pulled up to Natural Art Surf Shop who hooked us up with rental 3:4s and left them out back so we could have the day to ride. 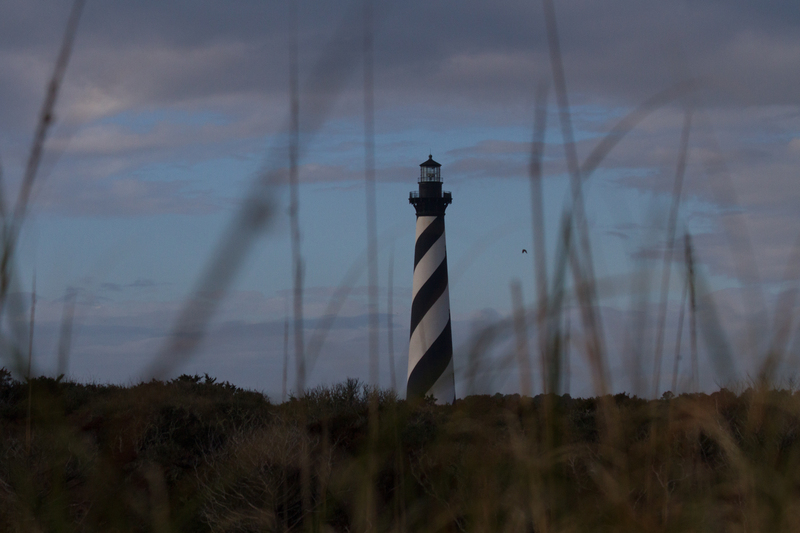 From there we followed the signs to the Hatteras lighthouse. Sixteen years ago I took my very first surfboard out at the lighthouse. My first session I hardly made it to my feet and the nose of the World Core board punctured my lower lip, but I was back. In 99′ they moved the lighthouse away from the eroding coastline so it looked different, but in all honesty I could hardly remember what it looked like before. I just knew that’s where the hook was set. Matt and I jogged through the deep puddles to the sand. Overcast with looming weather, but there was swell. We hooted at shifty peaks and talked about how far the jetties might reach out onto the coastal shelf. We had no clue. Only a few silent fisherman in knee-high boots dotted the sand. We played it safe and walked south before wading into the cool, deeply green water. The longshore current rolled us north even faster than expected. We each caught an insider to the sand and did a lap. Haley posted up on the dune as spotter and photog. She was also the protector of “stuff” as it looked as though the downpour was imminent. Our second swim was much more successful. We managed to find a sweet spot between currents. The swell was pumping and every few minutes the Atlantic turned one of those windy bumps to a drained out n’ gaping barrel. I found one. Leaning back to get the full view it was the vision I had been holding in my head for all those years. We had been out an hour or so when the sky began to turn. Matt’s waves were leaving him in a recycling rip and the wind was goading the waves into bigger and hairy form. The sets were focused on his head and I tread toward him thinking I might be able to help in some way. Misery loves company. When I was finally close enough to see, I found a wide-eyed and tired brother. He was completely calm, just waiting for the Ocean to let him get a rest. The impending storm never arrived and we rode south to find another wave. We first peeped what was left of the Buxton Pier. Ravaged by time and Sea, the mess of pilings clutched at the shifting coast in the memory of what it had been. There was no telling what lie beneath the surface, at the edge of Buxton the coast looked more welcoming. Several surfers sat in the lineup and the overhead sets called us out again. We shared another mind-bending session before calling it a day. I rode a few waves by a pack of local groms and wondered how many bodysurfers they had seen out here before. We cruised by the Avalon pier. In our teen years, my brother and I chased girls around the pier, bumped quarter machines in the arcade and played tackle football in the cool sand at night. There’s a certain repose found in a place so full of vibrant memory. Some sense of reticent wonder I’ll take with me home.